With news headlines shouting, “Sweet Poison” and “Sugar is Toxic”, many people are wondering if we should stop eating sugar. Yet basic nutrition has taught us that sugar is an essential energy source. What is the truth—should we quit sugar? Documentaries such as CBC’s Big Sugar and Hollywood’s Fed Up have dug into the sugar industry and sugar’s role in our food; they do not paint a sweet picture. It can be hard to believe that there are pros to eating sugar, but you actually need sugar to stay alive. Glucose sugar is the basic energy currency in your body. However, sugar is like everything in life: too much of a good thing can indeed be bad. We eat sugar in different forms, either naturally occurring in whole foods or concentrated and added in food processing. Whole foods like apples, carrots, or whole-wheat pasta offer your body a slow, steady supply of beneficial sugar. The white sugar you put in your coffee is an example of an added, unnecessary sugar, and it’s the focus of anti-sugar sentiment. You probably eat more of it than you think. According to Statistics Canada, the average Canadian consumes 26 teaspoons of sugar per day. Wonder where in your diet all that sugar is hiding? Simple sugar hides in candy, baked goods, soda pop, drinks . . . but it also lurks in decidedly savoury condiments and most processed foods. Excess added sugars quickly enter your blood stream and overload your body with available energy. This sugar rush is hard on your body and harms small fragile blood vessels such as those in your eyes and fingertips. 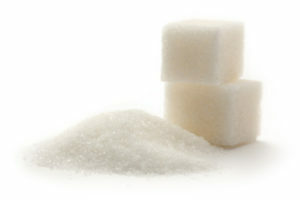 To reduce high blood sugar levels the body secretes insulin, which tells cells to soak up the excess sugar and store it. The body stores extra energy as fat. You can start to see why sugar has been blamed for the rising incidence of obesity in North America. Scientists at the University of California studied rats that were fed fructose syrup and discovered this simple sugar was disrupting synapses in the brain and affecting their ability to form new memories. According to the finding from Nurses Study, which followed 75,000 women for a decade, women who eat a high glycemic load have a higher risk of coronary heart disease. Further, scientists report that eating lots of added sugar is linked with glycation in the skin, which causes wrinkles to form. One great resource is Power Up: Master Your Blood Sugar, the life-changing eBook that offers holistic solutions to achieve optimum blood sugar levels. This book was created to bring positive change to the lives of people who struggle with blood sugar issues or type 2 diabetes. Power Up: Master Your Blood Sugar is a comprehensive guide developed from leading-edge science that helps the reader find foods to avoid, blood-sugar friendly foods to eat, supplements, and lifestyle suggestions. Power Up: Master Your Blood Sugar is available for Kindle on Amazon, Nook by Barnes & Noble, iBooks by Apple, Kobo for Chapters/Indigo and Copia. Agrawal, R and F Gomez-Pinilla. ‘Metabolic syndrome’ in the brain: deficiency in omega-3 fatty acid exacerbates dysfunctions in insulin receptors and cognition. Journal of Physiology, May 2012. Liu, S. et al. A prospective study of dietary glycemic load, carbohydrate intake and risk of coronary heart disease intake. AJCN 2000;71(6):1455-1461. Danby, FW. Nutrition and aging skin: sugar and glycation. Clin Dermatol 2010;28(4):409-11.